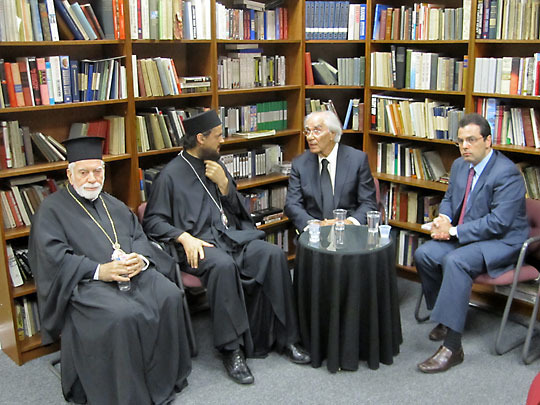 Chicago, IL - Eminent Orthodox Christian theologian, philosopher, and author Professor Dr. Christos Yannaras of Athens, Greece, lectured on the theme: "What Orthodoxy Can Offer American Society," on Saturday, September 25, 2010, at Holy Resurrection Serbian Orthodox Cathedral in Chicago. The event, held in the presence of His Eminence Metropolitan IAKOVOS of Chicago (Ecumenical Patriarchate) and His Grace Bishop MAXIM of Western America (Serbian Orthodox Church), marked the eve of the Liturgical celebration of the completion of the Cathedral Fresco Project and blessing of the frescos. Dr. Yannaras' lecture was preceded by a Vespers Service celebrated in the presence of His Grace Bishop MAXIM by Reverend Fr. Radovan Jakovljevic and Reverend Deacon Nikolai Kostur, while the beautiful festal responses were sung by the Cathedral's "Branko Radichevich" Choir under the capable direction of Presvytera Jelena Vranic.